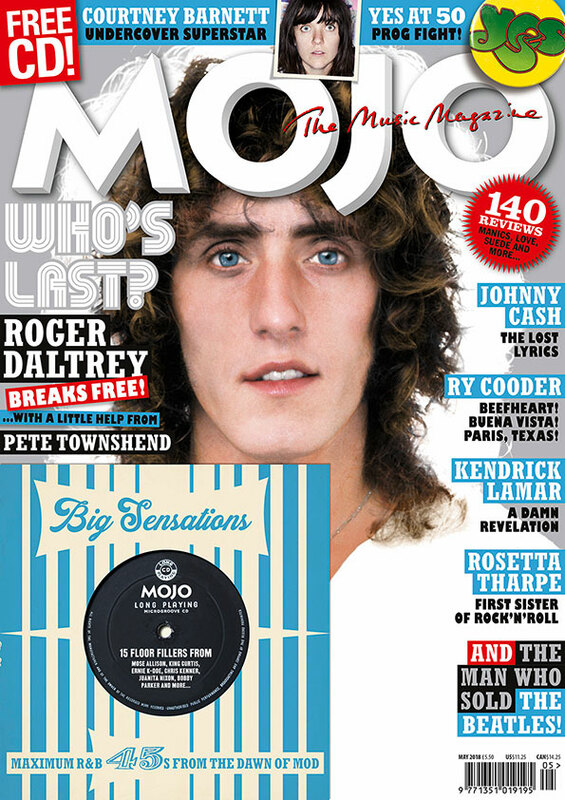 The new MOJO magazine features The Who’s Roger Daltrey (with a little help from Pete Townshend), Courtney Barnett, Ry Cooder and Yes. THE WHO’S ROGER DALTREY takes us on a rumbustious ride through his stellar career. Scraps with Keith, scrapes with death, plus the brand new solo album he’s made with the help of Pete Townshend (could it be Who’s last?). Meanwhile our free covermount CD collects R&B nuggets from the birth of Mod. Bobby Parker, Chris Kenner, Ernie K-Doe and Rosco Gordon are among 15 tracks of shakin’ and shimmyin’. Also in this issue: Ry Cooder slides on, Courtney Barnett dodges superstardom, Yes divide and conquer, Sister Rosetta Tharpe gets her due. Plus Beatles’ PR guru Derek Taylor, Johnny Cash’s secret poetry, the Texan Thai pop of Khruangbin, the madness of ZTT, Unknown Mortal Orchestra branch out, inside the eternal Forever Changes, Steeleye Span unpicked, Gaz Coombes portrays himself (in 3D) and Derek Smalls revisits the dawn and dusk of Spinal Tap. FREE CD: BIG SENSATION MOJO’s covermount CD collects R&B nuggets from the birth of Mod. Bobby Parker, Chris Kenner, Ernie K-Doe and Rosco Gordon target the dancefloor. COURTNEY BARNETT As her second album hits, Australia’s neo-grunge wordsmith has the world at her feet. How will she cope? “The pressure is definitely there,” she tells Jenny Bulley. YES Over half a century, the caped crusaders of prog have solo’d through triumph and tragedy, line-up (and key) changes. Yes’s latest twist? There’s now two of them. SISTER ROSETTA THARPE Saluted at last by the Rock and Roll Hall of Fame: the gospel belter and guitar pioneer who inspired Bob Dylan and rocked a railway station in Chorlton. DEREK TAYLOR When the Beatles’ press officer escaped to the US, benefiting were the Byrds, Monterey, peace and love. “He articulated the ’60s,” says Van Dyke Parks.